THE WHITE HOUSE has said it restored in full the media credentials of CNN reporter Jim Acosta, ending a contentious legal battle, but also warned that he may be ejected again if he fails to abide by new rules being implemented for media events with the US president. “Today the @WhiteHouse fully restored @Acosta’s press pass,” CNN said on Twitter. The White House said it also issued new rules that call for journalists to “ask a single question” and then “yield the floor”. Follow-up questions will only be taken “at the discretion of the president or other White House official”. We would have greatly preferred to continue hosting White House press conferences in reliance on a set of understood professional norms… But, given the position taken by CNN, we now feel obligated to replace previously shared practices with explicit rules. Sanders added that “a more elaborate and comprehensive set of rules might need to be devised” for interactions with the president outside the White House, but that it is holding back for now “in the hope that professional journalistic norms will suffice to regulate conduct in those places”. Acosta returned to the White House on Friday following a court order from a judge hearing CNN’s lawsuit alleging that Acosta’s ejection after a heated exchange with US president Donald Trump violated constitutional free press guarantees. CNN’s suit was backed by major media organisations, including Trump favourite Fox News. 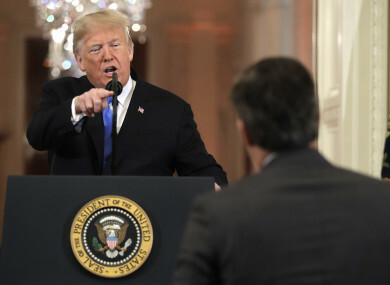 On Friday, Trump said that “rules and regulations” were being drafted to govern news conferences, where the president or his representatives often accuse journalists – Acosta in particular — of being overly hostile. Trump critics point out that the president frequently speaks harshly to reporters, for example, last week telling another CNN correspondent several times that her question was “stupid”. Email “White House restores CNN reporter's credentials, warning he must abide by new rules”. Feedback on “White House restores CNN reporter's credentials, warning he must abide by new rules”.